The Flexible Solution for Corporate and Education Environments Powerful and easy to use, this projector offers low cost of ownership, and ease of maintenance. Epson is pleased to introduce the Epson EB–95 3LCD Multimedia Projector. Powerful and easy to use, this projector offers low cost of ownership, and ease of maintenance. Beautiful crisp, clear images make the EB–95 is the ideal choice for use in a wide variety of Corporate and Education environments. Powerful 2,600 Lumens Light + Colour Light Output– The EB-95 is capable of being used in bright environments such as classrooms and offices. Wide Ranging Connectivity – The projector has a high level of connectivity allowing you to input a wide range of devices including HDMI, LAN, mic and VGA. Light + Colour Light Output of 2,600 lumens – The Epson EB-95 is capable of producing a bright image of 2,600 Lumens Light + Colour Light Output. With this powerful projector you don’t have to dim the lights or close the windows in order to see a bright, clear image. Wide Ranging Connectivity – The EB-95 is very versatile in the classroom or office, featuring a host of input options. 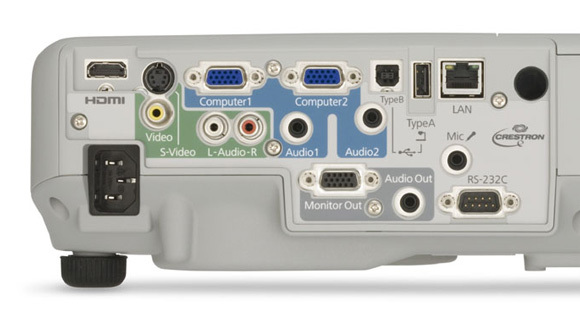 The unit boasts a HDMI, Video, S-Video, 2x VGA, USB A & B, Mic, RS232C, Monitor Out, Audio In + Out, and LAN inputs. Easy integration and advanced connectivity features allow you to evolve your classroom or office as you incorporate additional technology. This projector can also be connected directly to the Epson DC06 to help facilitate effective presentations and lessons without the need for a PC. 1.2x Zoom Lens – The high level zoom of the EB-95 provides installation flexibility, allowing the unit to be place in a wide range of mount placements. This feature could allow you to mount the new projector unit in pre-existing mounts, avoiding the cost and time of setting up a new mount to suit the projector. Network Functionality – With Epson Network monitoring and control software (Easy MP monitor), a single PC allows you to see which projectors are available and if they are running efficiently, even across the largest of networks. This series can be configured remotely, and you can receive instant email alerts for pre-defined critical indicators such as non-functioning devices or overheating lamps. Using this feature you can be sure that all projectors are operating correctly and be certain that all units are turned off at the end of the day and in the process, save time, money and reduce drain on the environment. Long Life Lamp - Lamp life for the EB-95 has an impressive 5,000 hours in high brightness mode or an amazing 6,000 hours in low brightness mode. We even back our lamps with a full 12 month, 750 hour* lamp warranty giving you the peace of mind. By the time you need to change the lamp in any of these products, you may have changed up to 2.5 lamps if you had used a competitor’s product from this category. Maintaining the EB-95 is easy even when ceiling mounted. Changing the filter or lamp is a simple in-situ, end-user changeable operation meaning you don’t require the additional expense of a visit from a service agent. Wireless Connectivity - With the addition of the ELPAP07 Wireless LAN Unit, the EB-95 becomes a part of your 802.11 b/g/n wireless network. For incredibly easy peer-to-peer wireless connection on the fly without the need for additional software, add the ELPAP08 Easy MP quick wireless connection USB key.